This time every year, millions of people across the globe commit themselves to the pursuit of virtuous goals, such as losing weight, being a more understanding boss or partner, obtaining a better education, eating more healthfully, and saving money. But when are such reflection exercises effective? 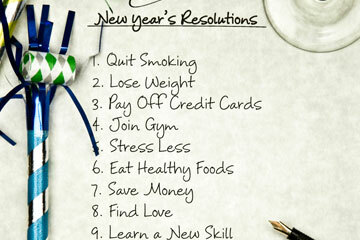 And will your resolutions stick and turn into real changes in your behavior? The contrast between our present shortcomings and the hoped-for ideal state that the New Year highlights not only boosts motivation but also helps us meet our goals. For instance, research has found that when individuals who intended to quit smoking wrote about their desired personal future first and then about the negative aspects of their current reality, this contrast was more effective in bringing their actions in line with their expectations than was only fantasizing about future success. Similarly, related research has found that individuals who were committed to the goal of supporting a charity pledged more money when focusing on the discrepancy between the current state (the amount already collected) and the target goal than when focusing on only the amount of money already collected. It seems that as long as our reflections highlight a contrast between a desired future state and present reality, they should motivate us to act on our goals. Although we can induce such contrasts between current and future goals in many ways (such as by getting feedback from trusted friends and advisors), a temporal landmark such as the start of a new year may be a relatively cheap way to motivate us to accomplish our virtuous goals. Importantly, though, if we feel close to our ideal state already, then the result will be complacency: we will congratulate ourselves for our anticipated achievements rather than take action. Now, let’s turn to the second question – whether our New Year’s resolutions will actually stick. As it is the case for other points on the calendar that demarcate the passage of time, such as one’s birthday or the start of a new job, the arrival of the New Year generates “fresh start” feelings that can motivate us to meet virtuous goals, such as exercising regularly or finally starting our diet. Psychologically, the New Year gives us an opportunity to wipe the slate clean, and these feelings do inspire beneficial behavior. For instance, a recent study examined gym attendance at the campus of a business school in the Northeastern United States. The results? Gym attendance increased at the start of the year, then decreased over the course of the year. We certainly do not need to wait until the beginning of the year to get off the couch more often. The start of a month, your birthday, or the start of work after holidays can be equally motivating, this research suggests. Even more interesting, the magnitude of these effects matches or exceeds factors that we would expect to dramatically influence exercise rates. For example, the increase in a person’s probability of going to the gym immediately following her birthday is equivalent to the effect of keeping the gym open for two extra hours. So, to answer the second question: yes, our resolutions may stick, but our commitment to them may drift over time unless we find regular ways to experience a fresh start. Many religions have rituals that give people the opportunity to begin anew. In Judaism, at the start of each New Year (called Rosh Hashanah), people reflect upon their bad deeds over the past year and ask for forgiveness, so that they can enter the New Year with a clean slate. Similarly, devout Hindus bathe in India’s holy rivers every year to wash away their sins and get rid of their past imperfections. Whether our reflections are religious in nature or not, their ability to highlight a disconnect between our past behavior and a better future may be worthwhile. However, even without the presence of such rituals, the upcoming transition to a new calendar year can trigger the same sense of dissociation from the past and move us closer to our virtuous goals.